The story of Mothers Day is the story of firm determination of a daughter, Anna Jarvis who resolved to pay tribute to her mother, Mrs Anna M Jarvis and all other mothers of the world. 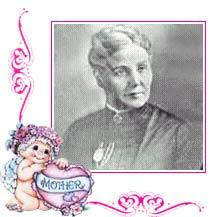 Anna Jarvis dedicated her life to fulfill her mothers dream of the recognition of day for honoring mothers. 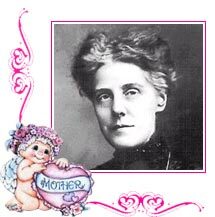 Though never a mother herself, Founder of Mother's Day, Anna Jarvis is today recognised as the 'Mother of Mothers Day'. An apt title to define the remarkable woman's ceaseless devotion to her mother and motherhood in general. After the death of her mother in 1905, Anna Jarvis resolved to honor her mother. She became all the more serious in her resolution when she found that adult children in the US were negligent in their behaviour towards there parents. Besides the desire of her mother that someone would one day pay tribute to all mothers, living and dead and appreciate their contributions made Anna decisions even more stronger. To give shape to her resolution, Miss Anna Jarvis along with her supporters began to write hundreds of letters to those holding the positions of power advocate the need for a national Mothers Day. A fluent speaker, Anna used every platform to promote her cause. Though the response was cold initially, she achieved a breakthrough by gaining the support of great merchant and philanthropist, John Wanamaker of Philadelphia. The movement gained a fresh impetus with his support. In 1909, forty-five states including Puerto Rico, Hawaii, Canada and Mexico observed the day by appropriate services. People also wore white and red Carnations to pay tribute to their mothers, according to the tradition started by Anna Jarvis. Anna chose carnations because they were her mother's favorite flowers. White carnation was her most favorite because it represented the purity of a mother's heart. A white carnation was to be worn to honor deceased mothers, and a red one to honor a living mother. An activist to the core, Anna Jarvis stepped outside the four walls of the house. Striking feature of her personality is that she did not frowned on the traditional women who felt complacent staying at home. Instead she strived to bestow honor and dignity on women who were homemakers. This was one of her main purpose of celebrating Mothers Day. Mothers Day is meant to give due honor to the woman who gave us birth and life. Though we often have the feeling of gratitude towards our mothers we do not confess it often. Mothers Day is celebrated to share those feeling with our mothers. To spend some time with her and make her feel special. Those staying away from mothers must express their feelings of love and gratitude by writing to them or talking over phone. It is poignant to note that though Miss Anna Jarvis devoted her life for the establishment of national Mothers Day but in the end she was disappointed at the way thing turned out. She was concerned with reform, not revenue. She hated the commercialisation of the day, so much so that she felt sorry for ever starting the tradition of celebrating Mothers Day. Anna died at the age of 84 on November 24, 1948. She is interred beside her mother in West Laurel Hill Cemetery in Philadelphia. On the day of her burial, bell on the Andrews Church in Grafton was tolled eighty-four times in her honor. The Anna Jarvis Birthplace Museum is located four miles south of Grafton on U.S. Route 119/250. Mrs Anna M. Jarvis gave birth to 11 children but only four lived to adulthood. Inspite of the large family, Mrs Jarvis maintained an active life. She regularly participated in activities of the church and civic affairs. Her remarkable contribution to the society in which she lived was the formation of Mothers Day Work Clubs in the local churches. Mrs Anna Jarvis called on the women of Webster, Philippi, Pruntytown, Fetterman and Grafton to join the club and combat poor health and sanitation conditions that existed in those time in their neighbourhood and attributed to the high mortality rate of children. The clubs were highly successful and their role in tackling the local community problem was honored by all. During the Civil Wars, Mrs Anna Jarvis urged the members of Mother's Day Work Clubs to take a neutral stand and nurse both Union and Confederate soldiers. Near the end of the war, the Jarvis family moved to the larger town of Grafton, West Virginia. In 1865, after the Civil War, Anna Jarvis organized a Mothers' Friendship Day at Pruntytown Courthouse. This was done to bring together soldiers and neighbors of all political beliefs. The event was a big success and came to be organised annually for several years to promote peace and friendship. After the death of her husband, Granville E. Jarvis, in 1902, Ann Marie Reeves Jarvis moved with her daughters, Anna and Lillie, to Philadelphia to live with her son, Claude. Mrs. Jarvis died at the age of 72 on May 9, 1905. She was interred in the West Laurel Hill Cemetery in Philadelphia. On the day she was laid to rest, the bell of Andrews Methodist Episcopal Church in Grafton was tolled seventy-two times in her honor.